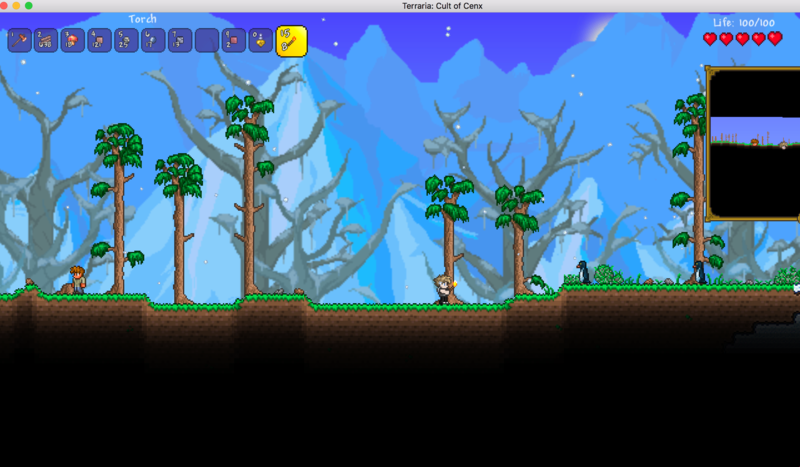 With user-friendly 2D design, early-Nintendo-esque animation, and seemingly endless gameplay possibilities waiting to be unearthed, it’s no wonder Re-Logic’s sandbox adventure game Terraria has gained a somewhat cult-like following. After initial success on PC, the game was later redeveloped by 505 Games for console and mobile formats. In addition to being available on iOS, Android, Xbox, PlayStation, Wii U and 3DS, a version for Nintendo Switch is expected to be released later this year. The community that enjoys the game is expansive, ranging from young children to top level gamers. 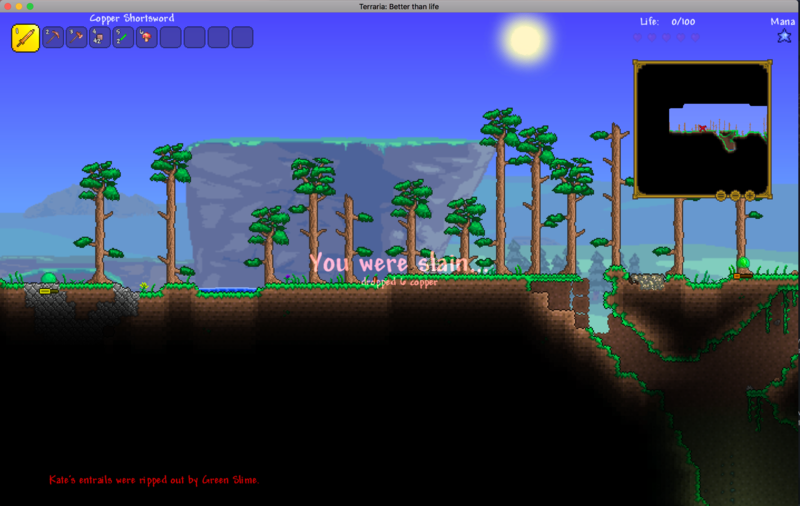 But be warned—though seemingly accessible for all skill levels, Terraria isn’t as simple as it first seems. For starters, there are a lot of ways to die. Within the first half hour of play, I was killed by arctic slime and eviscerated by vultures—and those weren’t even the most relentless early foes I faced. By the time I got the hang of it and realized building a house for defense is arguably the most vital step of gameplay, there were already seven tombstones generated where my character had previously died. “Often times you die so much in that first hour, a lot of people rage quit and bounce out of the game,” Welch said, laughing after I explained my struggles. 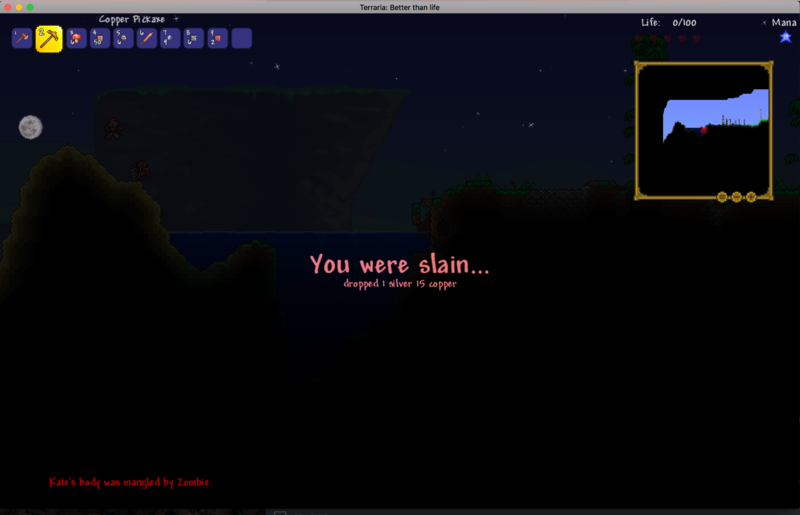 “I felt like a lot of my job working on the game, bringing it to consoles and mobile, was trying to bring people through the initial learning curve.” According to Welch, there are multiple ways players approach Terraria. Some concentrate on building houses and mining to Hell, the deepest world layer. Others become more invested in the RPG aspect of the game that has players face a number of bosses and enemies, which expands their abilities such as increased health and specialized armor. 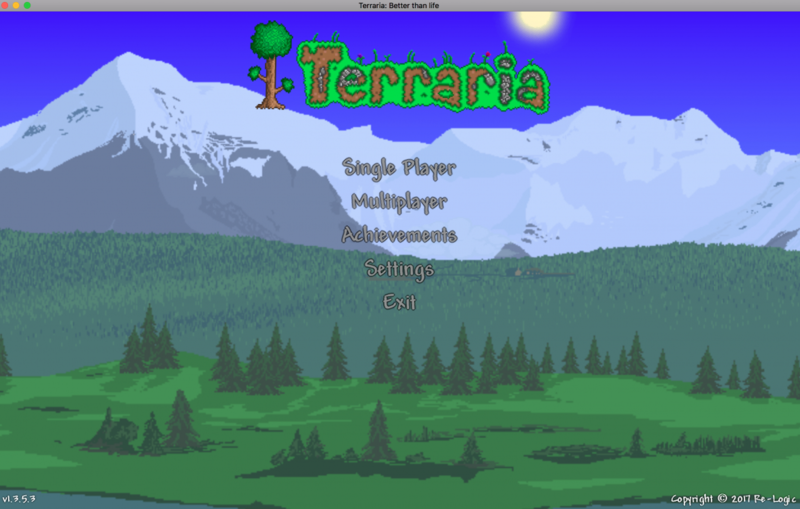 Players start with necessities including an axe, a sword, and a pickaxe. While simple weapons such as bow-and-arrows can be crafted on a workbench early in gameplay, the longer the player explores the world and discovers new items, the more advanced the techniques and objects would become. 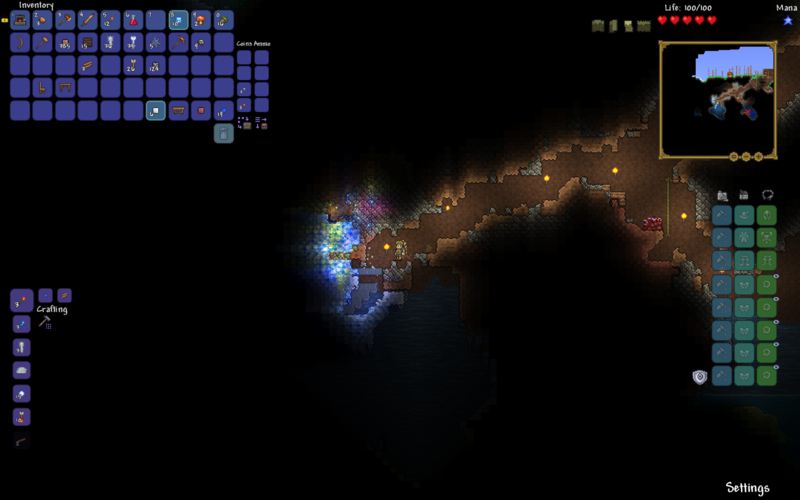 The hidden caverns of Terraria are expansive, an underground tunnel network filled with endless surprises, precious minerals, and treasure chests create further opportunities in the game. One feature particularly interesting is that the creation of characters and worlds can be independent from one another. For example, I was able to create a new character but play with them in a formerly created world I created with my previous character. This feature was particularly useful when I made the rookie mistake of accidentally tossing my pickaxe somewhere, causing my original character to become trapped between a literal rock and a hard place.If, unlike me, a player plays long enough to actually slowly master the game, rare exclusive items can be unlocked and crafted, especially while taking on the third and hardest skill level, “Hardmode”. Some of the coolest items include the Reaver Shark pickaxe (yes, an actual mini-shark the player can wave about), a jetpack and wings. 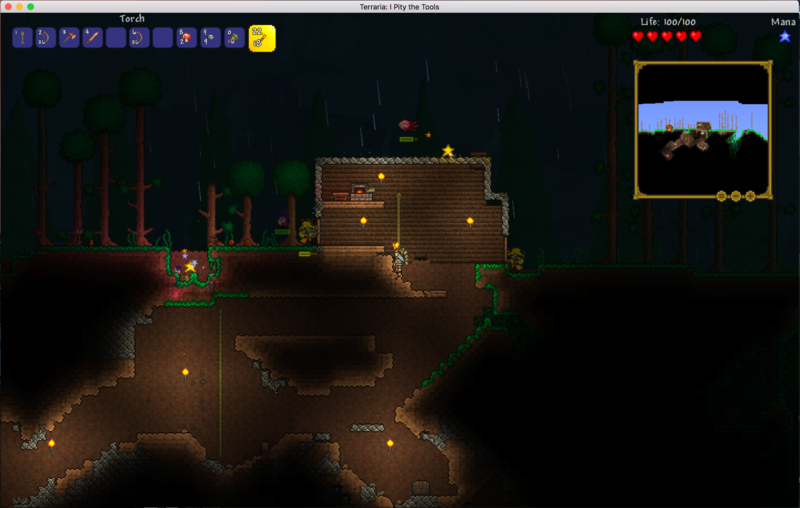 It’ll be interesting to see if the pending release on Switch will more readily bring the highly imaginative Terraria out of Minecraft’s shadow and help garner the recognition it deserves, from novices to pros alike.